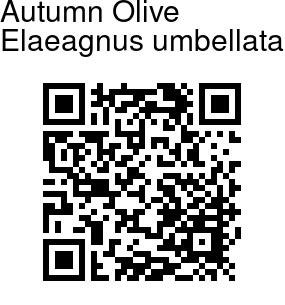 Autumn Olive is a small tree or shrub, often spiny. 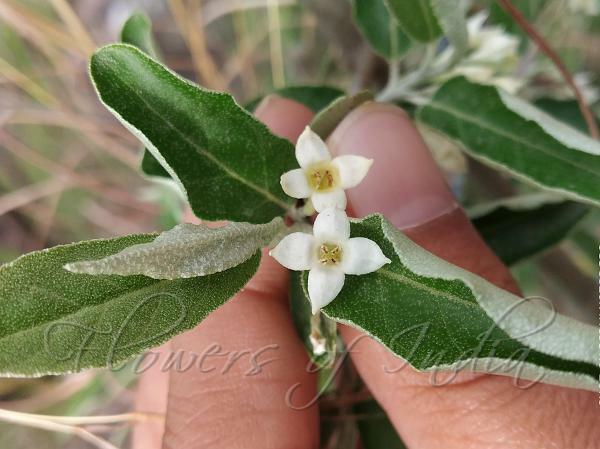 The small white (fading to yellow) flowers have a sickly-sweet aroma. The leaves are densely covered with silvery scales beneath and have scattered silvery scales above. The petioles and young branchlets are also covered with silvery scales. Leaves are 2-9 cm long, 0.8-3 cm broad, elliptic-oblong to oblong-lanceolate, blunt ot pointed, dull green above, with peltate and stellate hairs, lower surface sometimes with ferruginous scales. Leaf-stalks are 2-6 mm long. Fruit is 8-9 mm long, elliptic-ovoid, succulent, covered with scales when young, endocarp not hard, 8-ribbed, woolly within. Autumn Olive is found in the Himalayas, from Kashmir to Bhutan, Assam and W. China, at altitudes of 1300-3000 m.